In the Arena by Isobel Kuhn - First published in 1960, this book follows the life of missionary Isobel Kuhn as she seeks to make Christ known in rural China during the Japanese invasion. A Gospel Primer for Christians by Milton Vincent - Filled to the brim with the Gospel - the Good News - this is a gem of a book to read, ponder, pray through and daily live out. The Meaning of Marriage, by Tim Keller - an excellent book regardless of your relationship status. Keller wisely examines our cultural opinions and perceptions of marriage, then takes us back to the Bible to understand again it's different and glorious purpose, and finally offers counsel on relationships that honor God. Mended: Pieces of a life made whole, by Angie Smith - a book based off of some of her most popular articles on her blog. Angie combines daily life, a thirst for God's word, and a quick wit in these devotional-esque chapters that will make you think and see your favorite stories differently. Christ Formed in You by Brian Hodges - it is a book that discusses how the Gospel brings about an internal change in the heart that motivates the outward changes in our actions that follow. Undaunted by Josh McDowell - it is a wonderful biography that shows how God does pursue us with the love of a shepherd pursuing a lost lamb. Not a Fan by Kyle Idleman - we are not called to be Jesus' "fans" also known as "enthusiastic admirers", but true followers of Christ. The Pursuit of God by A. W. Tozer - this book is a classic in Christian literature that lives up to its title. The Lost Prince of Samavia by Frances Hodgson Burnett - the story follows a boy named Marco as he attempts to serve his country of Samavia and find the lost Prince. Lines to Live By edited by Clinton T. Howell - a collection of beautiful poems on various themes such as character, courage, and gratitude. 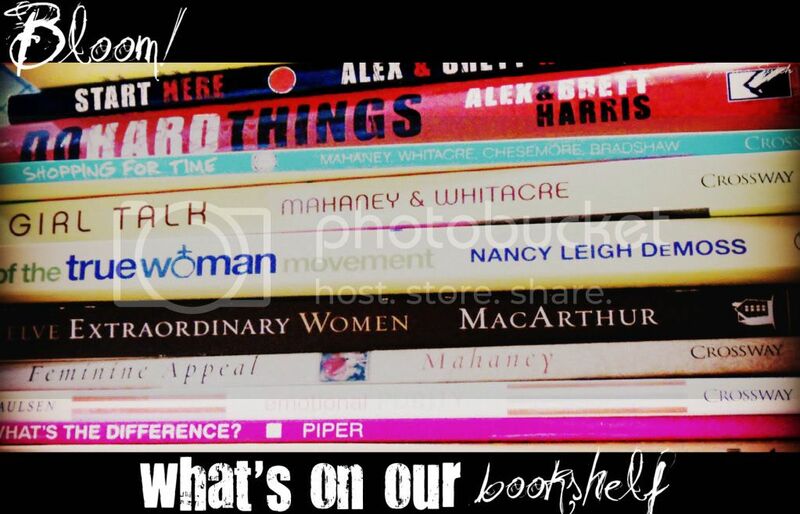 We'd also love to hear what is on your bookshelf! Feel free to comment and recommend some good reads, too! My Grandma has it. She lives alone next door. But we're afraid she'll pass out and we won't know. NOW, she is having trouble even going to the bathroom without feeling like she could pass out. Please pray for her strength, for her to quickly recover, and help us to find someone who could take care of her 24 hours a day till she gets better. She's normal the one in charge, but now she has to be someone's charge, so she's also feeling kind of (actually REALLY) helpless. Carissa - yes, I love the Ludys' books. They are so encouraging and inspiring! Abi - we are praying for your family. Hope you all get better real soon!